Source Code Management (SCM) – Currently I prefer using Mercurial. It is written in Python and has a low learning curve. Although similar to GIT I don’t think there is much to argue against or in favor of GIT over Mercurial. Most of the time I’m fiddeling around with the command line but for merging I use meld (nice 3-way view) and hgview (it’s faster than the hgk extension) for viewing the current status of the repository. Issue Tracking – Since I’m coding in small teams only I find a story board which is located next to the code most convenient. For bigger teams I would favor Mantis. Project hosting – Although I’m not a huge fan of Sourceforge it currently offers all I need. Major issue against Sourceforge is the performance of the service. But the ability to deploy website is a must have for me. Packaging – I use pip to access pypi – Why? Because of the uninstallation and build features it offers. And also the pip requirement files are nice! Documentation – I find the sphinx tool very convenient. It comes with nice themes, good code integration and easy to write markup language. IDE – I use IDLE for smaller edits, when doing real coding I currently run Aptana Studio Beta 3 – Try it out – it has some nice features (Like the build in Terminal, Python support, Refactoring, Code Formatting, Usable for website development as well etc.). Shell script – This is probably not the nicest way but for now the fastest. I have one shell scripts in place which is called by hudson (Main reason why it is a shell script) and which I use to deploy versions of the software to pypi. Whenever I deploy those scripts for example first ensure that all tests run and after a successful deployment they create a tag in the SCM with the version string. tornado web – It is fast, and the asnc calls are nice. The ideal framework to write RESTful service in python. Overall I’m pretty happy with this setup and find it good for fast coding. I usually write unittests (With test for success, failure and sanity for every routine) first before starting coding. I don’t find it a time waste but actually I’m pretty sure that the overall setup allows me to code and refactor faster. Maybe others or you (?) also want to writeup their setups and we can start a site like The Setup for Software Development? Please Retweet and share the link! Update: Also have a look at this Python and Dtrace blog post. Both are external scripts. Now in the post-build section activate the JUnit test reporting and tell it to use the **/nosetests.xml file. Also activate the Cobertura Coverage report and tell it to use **/coverage.xml. Finally activate the Report Violations – and add pylint.txt in the right row. Configure the rest of the stuff just as you like and hit the Build button. Thanks to XML the reporting tools written for java can parser the output generated for your Python project. 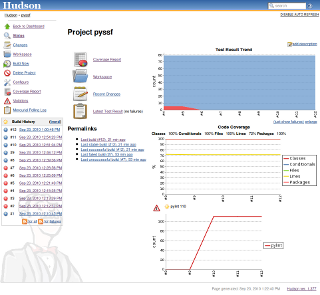 Now you have nice reports from a Python project in Hudson! A more detailed and great article about this topic can be found here. Other tools are so overblown that they are hardly usable – and again an external tool makes that the stories and their states are not stored near the source code – where the belong IMHO. 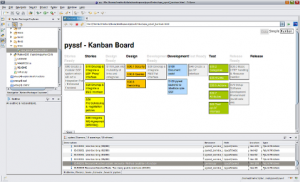 So I stumbled upon simple-kanban an easy tool where you basically can just drag and drop stories around based on their state. There is a very simple editor for editing the stories and the best feature is: It’s an single HTML file which you can check-in next to your source code in your SCM. And with the web browser integrated in eclipse even open in your IDE. Go to the data view and copy all stories. Then simply edit the source of the HTML file with an editor of your choice, preferably one which knows HTML. There you can paste the copied stories over the old ones and save the HTML file. I didn’t like that – and since I knew of tiddlywiki, which is another single page application (SPA), which can store data, I thought I can update it. 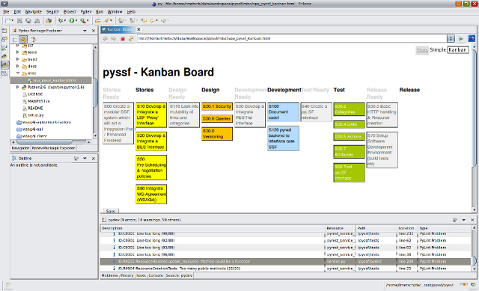 So I took the saving features from the wiki (described here BTW) and integrated them with the simple-kanban board. Now I have a save button and do not need to do nasty copy & pastes into source codes. Open source & making money: two worlds? I’m a big fan of Open Source Software. But I can also understand that making money is important nowadays. And to be honest I feel more confident when a company is involved in the development of a tool/product/application. I think communities are great – but a company with real QA and who needs to make money out of a tool/product/application has a motivation to make the best out of the tool/product/application. Now the question is: How do you make money with this in mind? Simply by selling support contracts? I have seen companies fail with that model.